It’s winter time and it’s freezing. As parents, we simply want to make sure that our child is warm, cozy, and most of all, safe. 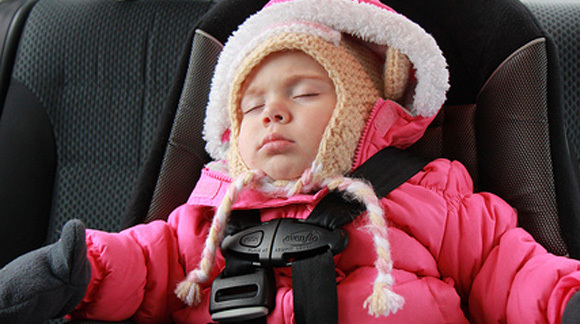 However, having your child wear a warm, puffy jacket while strapped into a car seat is the last thing you should be doing. You think your child is safe and warm, right? Well, what you really are doing is setting them up for possible life-threatening danger. I have small kids and it turns out I make this mistake every winter. I had no idea. Go to the next page to watch the crash test video to see this for yourself. Totally agree. I’ve seen many parents insert all kinds of things under the harness straps to keep their babies comfortable, but it’s totally unsafe in the event of a crash. 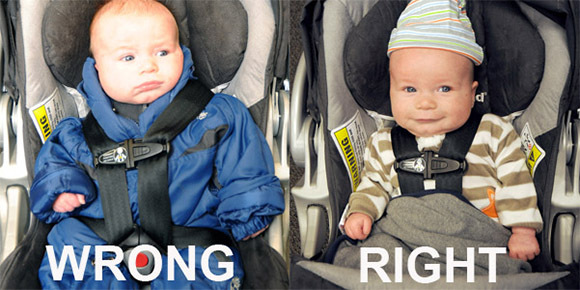 In both cases the car seat straps were not tight enough on the actual child. They were WAY too lose. Notice they did not try to pinch the shoulders on on the coat wearing dummy. Not so sure of how I feel about this and how reliable the test was. I completely agree they were not tight enough.